PAWS cofounder Pat Derby passed away on February 15, 2013. 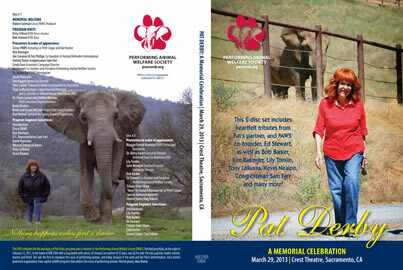 Pat's memorial service was recorded on March 29, 2013, at the Crest Theatre in Sacramento, California. This 2-disc set includes heartfelt tributes from Pat's partner and PAWS' co-founder Ed Stewart, as well as Bob Barker, Kim Basinger, Lily Tomlin, Tony LaRussa, Kevin Nealon, Congressman Sam Farr and many more. (Shipping within the U.S. only. To order from outside the U.S., please contact our office.) Allow 2-3 weeks for delivery. are available for sale through SmugMug. Click on the logo above to view and to purchase. animal lover in your life! Treat a family member, or a good friend, to this once-in-a-lifetime experience. 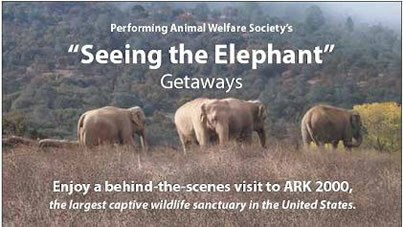 A PAWS’ "Seeing the Elephant" Getaway offers an educational behind-the-scenes visit to the nation's first elephant sanctuary – PAWS’ ARK 2000 in San Andreas, CA. Choose a one-day tour, or a two-day weekend getaway with overnight stays in a Victorian B&B. A gift certificate will be sent to the recipient acknowledging your gift. For detailed information on the "Seeing the Elephant" Getaways, CLICK HERE. Contact Kim Gardner (916) 539-5305 or kimkleingardner@yahoo.com. Reservations must be received by December 15 for Christmas delivery. Adopt* a PAWS "Wild Child" (animal) for yourself, a family member or a friend. It's the perfect gift for the person who has everything! Your gift adoption helps us provide nutritious food, veterinary care and an enriching habitat for the animal you choose to adopt. An acknowledgement of your gift. A biography of their adopted animal. A certificate of adoption and a color photograph of their animal. Guest pass to one regular PAWS open house (special events are not included). Periodic mailings and invitations to special events. If you wish to purchase a gift adoption, CLICK HERE. *Adoptions are symbolic only. No animal will be sent. While working as an animal trainer in Hollywood more than 35 years ago, PAWS co-founder and director, Pat Derby, witnessed first-hand the neglect and abuse prevalent in the industry. Pat specialized in non-abusive training using positive reinforcement, unlike most Hollywood trainers at the time who relied on dominance and physical force. Determined to initiate better standards of care and handling for performing animals, Pat chronicled her experiences in her first book, The Lady and Her Tiger. An exposè on the treatment of performing animals, it was chosen as a Book-of-the-Month-Club selection, won an American Library Association Award in 1976, and caused her career in Hollywood to come to a grinding halt. She retired the animals she owned, bought a resort among the redwoods of northern California, and threw herself into full-time activism, education and fundraising. In 1984 she and partner Ed Stewart founded PAWS. The Performing Animal Welfare Society's "Everything You Should Know About Elephants," now in its third printing, provides the reader with reports, opinions and studies by some of the world's top scientists, animal behaviorists, veterinarians and wildlife experts on the treatment and needs of both captive and wild elephants. The information contained in these 72 pages will empower you with the facts needed to advocate for the humane care and treatment of captive elephants, and also provides you with examples of what you can do to help. When you shop with these retailers, you're donating to PAWS! You shop, PAWS wins! Help the Performing Animal Welfare Society for free. Up to 26% of your purchase at over 1,600 retailers will be donated to the Performing Animal Welfare Society by visiting www.iGive.com and registering. Then check out great offers and deals, like free shipping and double donations. Use the links on the iGive.com site to visit and shop at your favorite retailers like Target, EBAY, Home Depot, Barnes and Noble, Office Depot, Best Buy, Lands End, Nordstrom and many more. iGive.com will send the money that everyone has raised to the Performing Animal Welfare Society.